Oh yes....I wish my Mama would spend her day with me instead of going to work.... purrr...meow! Caren...thanks for the sweet comments about my blogiversary; much appreciated. Love the drawing! We agree though that there's nothing like a cat/human nap combination!! @Diane "snoozing" is always good! You are most welcome!! @Cat from sydney that is what Bobo used to say! Hope you've a good snoozeeeeee with your mom today! Awwwwe!! That is soooo sweet!! That is such a great picture and oh so true. We all love to snuggle together. Have a great day. Very nice, and I agree! @Old Kitty thank you! Mum is!! 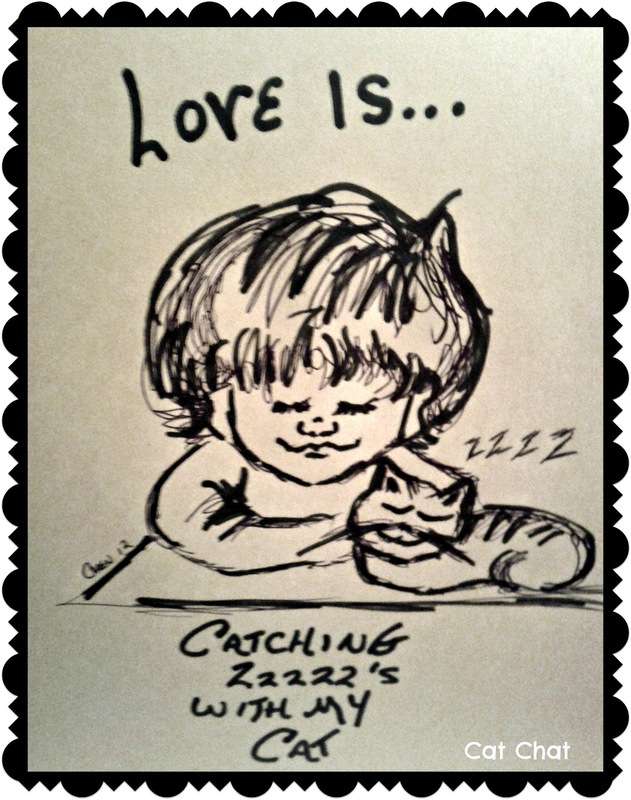 Love is...catching zzzzzz's with our human!! So true! Sweet purrs, sweet friends! Hmmm, that's just a little too much togetherness for me, though I have been pleased the Human is on a "summer schedule" at school and is home more with me. But she needs to keep her distance all the same. That's so cute! My cats love to sleep on a lap and I like to snuggle up as well. We loooves it when mommy naps with us! HIGHPAW!